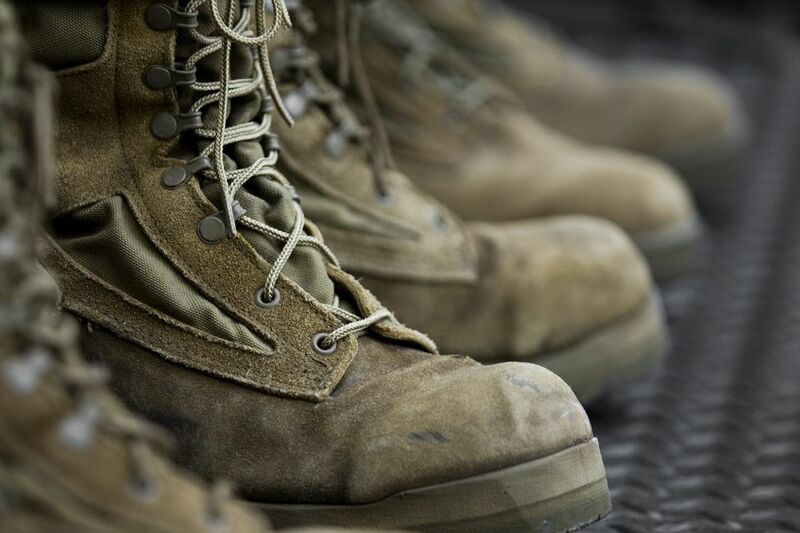 For decades our military forces followed the routine of the thousands of others who came before them by keeping their black leather boots with a spit and polish shine. But with the conflicts in hot, desert climates and the advances in fabrics and materials, several new forms of military boots were introduced made of suede and man-made fabrics. Whether you are in the military or have purchased similar suede boots, there are ways you can keep them looking good and feeling comfortable. First, you may receive some poor advice from others on how to "break in" your boots. Never soak the boots in water or bake them in an oven to break them in. Boots should be broken in gradually with walking or marching distances increased over time. Step One: As soon as possible upon purchasing or being issued combat boots, buy a suede shoe cleaning kit. The nylon quarter panels are easy to care for but the suede areas can be difficult to keep looking nice without the care kit. Suede is created from the underside of the leather hide and has a napped, rough texture. While leather in combat boots is not finished as finely as your suede jacket or hat, it can still be a finicky finish that has to be cleaned correctly or it can be ruined to the point that it cannot be restored. A good suede cleaning kit will include a non-metallic bristle brush, boot cleaner, and a type of preserver or conditioner. If you don't have access to a kit, use a soft cloth or a soft, nylon bristle brush for daily cleaning. Do not apply commercial waterproofing products or shoe polish to these boots. It is important that the materials remain breathable for maximum comfort during wear. Step Two: By cleaning the boots regularly, you can prevent excessive staining and wear. Daily cleaning is easy. Use the soft brush or a soft cloth to lightly brush off dust and dirt. In a pinch, you can even use an old toothbrush. Even with a full-size brush, the toothbrush is handy for cleaning small areas around the eyelets and sole tread. Step Three: If the boots get mud stains, allow the mud to dry completely. Grab the large brush and scrub off the excess soil. If stains remain, mix a 1/2 teaspoon of dishwashing soap with one cup of warm water, mixing well. Dampen a sponge or soft cloth with the solution and wipe away any excess dirt on the nylon or suede. DO NOT use a harsh cleaners that are alcohol or oil-based. The alcohol will dry out the leather and the oil-based cleaners will leave stains on the boots. After cleaning, wipe down with plain water and allow to air dry. The boots are made from water-resistant materials but can still become damp or wet due to perspiration or water entering over the top of the boot or through the eyelets. If the boots are wet, always allow them to air dry away from excessive heat including direct sunlight, hair dryers, or heating vents. For scuff marks, there are suede erasers or suede stones that you can purchase. Use a light touch and rub back and forth a couple of times to remove the scuff. Do not scrub heavily or the nap will be removed and cannot be repaired. An art gum eraser can also remove scuffs and excessively rough areas on the suede. For oil stains, sprinkle the stained area with baking soda, corn starch, foot powder, or baby powder to absorb the oil. Allow the powder to sit for at least thirty minutes and then brush away with the soft brush. Repeat if oil remains. Step Four: It's important to keep the inside of the boots clean as well, mainly for your own comfort. First, remove the insoles from the boots and allow them to air dry. If you feel the insoles need to be washed, always hand wash with a gentle soap like saddle soap. NEVER put them in a washing machine. The agitation from the spin cycle can ruin shape. If the shoelaces need a cleaning, this a good time to wash them as well. While shoelaces can go into a washing machine, hand washing is easier and you are more likely to get both of them back. Finally, use a soft cloth and the dishwashing soap/water mixture to wipe down the inside. Follow up with a wipe down with plain water and allow the boots to air dry. If Athlete's Foot is problem, spray the inside of the boot with an anti-fungal spray.